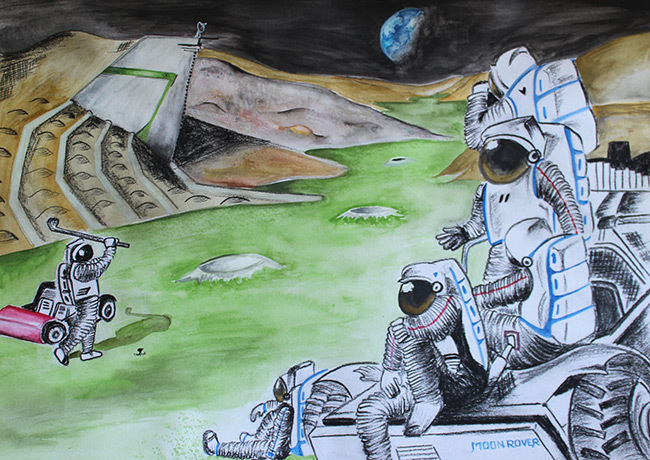 The following three images were the winners of the 2015 NSS Roadmap to Space Settlement Student Art Contest, followed by two Honorable Mentions. Description: A group of astroworkers working on the construction of the international lunar outpost, which is a permanent lunar base made in conjunction with private aerospace corporations and government space agencies all around the world. The expandable lunar habitat truss is connecting each of the primary hubs which are fully pressurized for larger living space. Tools used: Autodesk 3dsmax 2009 and Zbrush 4 for modelmaking and rendering. Post production, final editing and color correction with Photoshop. Description: HRAM is a laboratory and research center, being the first step in colonizing Mars. 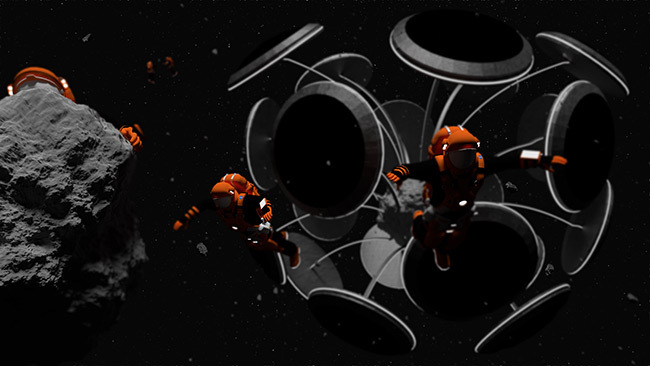 The habitat has two airlocks incorporated. It also features an agricultural section, a research center and the residential area. 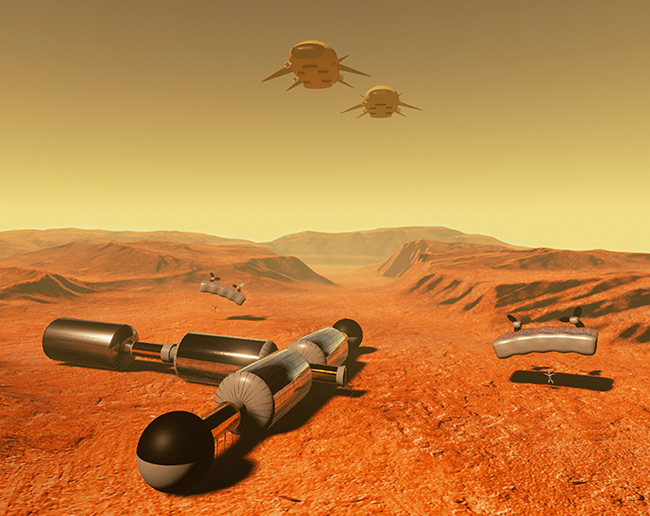 People can explore Mars in a variety of ways such as the Martian Dirigible which is filled with hydrogen and used to transport people over long distances on Mars, and the Martian Paraglider which is filled with 200 cubic meters of hydrogen, being able to carry one person plus another 50 kilograms. Tools Used: Autodesk 3Ds Max 2014, World Machine, Adobe Photoshop CS5 and Unreal Engine 4. 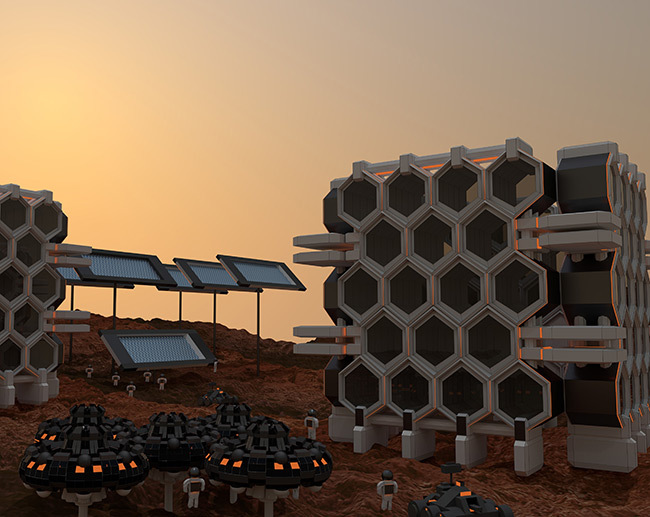 Description: Here is depicted a Mars settlement based on a hexagonal structure which is resistant to shocks and earthquakes. This illustrates a basic settlement to support commercial work (such as buildings, water recycling, mining, transportation units), whereas other units for solar power are under development. The hexagonal apartments are self-contained and protect inhabitants from radiation. Tools Used: The 3D models were created and rendered using Blender 2.71 on iMac running OS X Yosemite. Crazybump (Mac beta test 2) was also used to create bump maps representing surface of Mars. 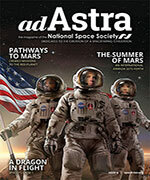 First a curved surface representing a region in Mars was created. On top of this surface, other features including buildings, transportation units including rovers were built. Description: Ever since the idea of a human space settlement was first suggested, asteroids have been considered one of the best sites for building a settlement. In spite of the fact that asteroid collisions with Earth can only bring chaos, I believe that they should be our friends, not our enemies. 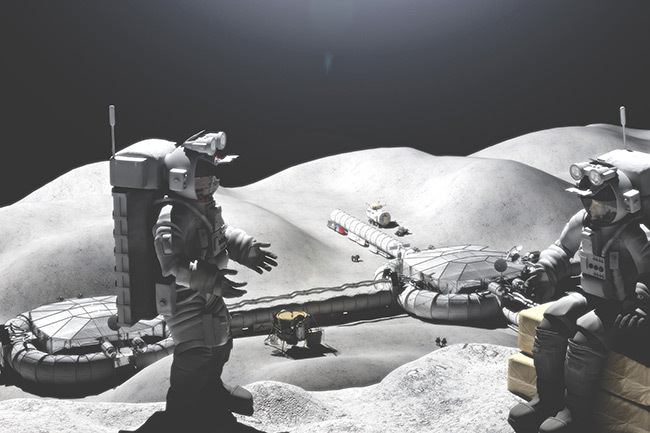 The picture above depicts several astronauts engaging in a spacewalk right outside one such settlement, with the purpose of studying the neighboring asteroid shards. 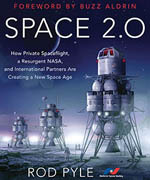 The spacecraft in question is Dandelion Five, the fifth settlement among the asteroids. Tools Used: The 3D modeling was done in Blender (a professional free, open-source computer graphics software, similar to Autodesk 3D Studio Max) and rendered using the Cycles rendering engine, thus granting the artwork its realistic look. The picture was then retouched using image manipulation software (GIMP, Adobe PS) and minor details like the depth of field and the stars were added (it is worth noting that capturing a starry sky in space with all the bright objects around would require huge exposure from the camera). Description: The painting depicts astronauts enjoying their leisure time and playing golf in their new space settlement. Tools Used: Water colors and charcoal pencil have been used in my painting.